In the entire trip we experienced weather changes from -2 to -34 degrees celsius. Moscow was the first place where the temperatures eased a bit and when we arrived from Ekatrinburg, the temperature was about -3 or so and it was snowing heavily. Below is a photo of three of the six member gang – @nat, @aish and @pradeep. We had to look away from the way wind was blowing as we kept catching the snow in our eyes. This picture was taken right outside the Moscow railway station while we were waiting for the taxi. One of the good things about this trip was that everyone enjoyed long walks and we took full advantage of it. Below is a photo taken while we were crossing a park. 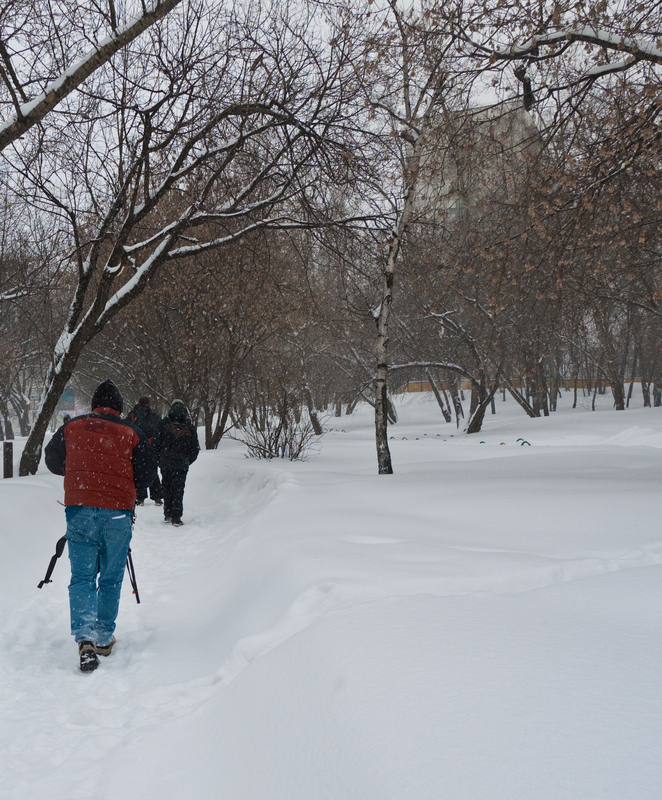 It was snowing mildly and the temperature was just nice for us to enjoy the day walking across the city of Moscow.